Just watching actors interpret roles in a movie may seem to the viewer as though it’s chocolate. But the artists who boldly go in front of the camera and coin the message to go across via their actions would tell you it’s not usually what it seems to be. It requires more than just wearing beautiful costumes and make-ups and coming on set. It takes a certain degree of interpretive capacity in a bid to tailor the act to have its intended impact on the audience. Over the years, Syriette Che has understood this challenge and has finetuned her acting skills to meet the standards, set by actors who got into the art before her. 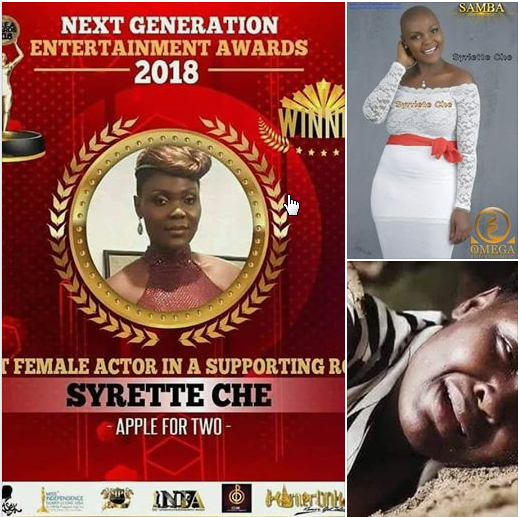 Having put in much to that effect, Syriette who is one of the lead actresses in SAMBA (TV series produced by Brenda Elung and directed by Enah Johnscott), is now reaping the fruits of hard work. She had hardly digested the 2018 The African Film Festival (TAFF) Best Actress in Lead Role when two other awards came calling – 2018 CAAFA Best Actress in Supporting Role and 2018 Next Generation Awards (NEGA) Best Actress in Supporting Role. And you would imagine that all these came within a few months, the same year. Such recognition is clear an indication that the performing artist has convincing acting up her sleeves. This Sunday, September 26, 2018, Apex 1 Radio celebrates Syriette Che. The award-winning actress will present the story of her career and where exactly she hopes to take it to. She will be the protagonist on Apex Snapshot (film version). The show starts at 11am eastern time (4pm in Bamenda) on www.apex1radio.com Also join live on Facebook. Catch you then!